If you, like me, are of the opinion that Judge Judith Sheindlin isn’t paid enough, even as TV’s highest-paid entertainer whose robe pockets are lined with a $47 million annual salary, here’s good news: She just got more money. Sheindlin sold her library of past and current episodes to CBS TV Distribution—that’s over 5,200 hours worth of footage, says The Hollywood Reporter. That’s enough Judge Judy to run for over 216 days straight 24/7. If that block started airing January 1, it’d run out August 4. Sounds like heaven to me. 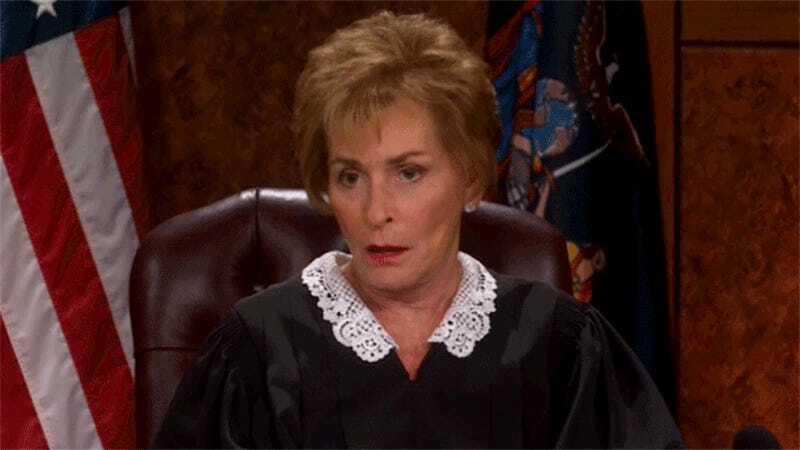 The pitch, per multiple sources who heard it: TV stations — those that currently air Judge Judy originals as well as their competitors — will be salivating for anything Judy once the first-run episodes conclude in 2020 (as initially planned). Plus, the No. 1 court show has yet to be exploited in much of the streaming, cable or global marketplace. As part of the deal, Judge Judy was picked up for another year, which means it’ll be on at least through the 2020-2021 season. The show continues to average over 10 million viewers a day, a fact that anyone who watches is well aware of since Judy regularly reminds the fools she refuses to suffer that 10 million people are watching them. And may she never stop doing so. To celebrate this news, here is a picture of Judge Judy kissing Mrs. Brady (aka Florence Henderson, RIP) on the lips in 2008.